Neil is a Janny for a school in Grangemouth, and has been for a long time: when we talked about it recently he mentioned 14 or 15 years. Tempus has definitely fugit-ed, although the friendship has continued across the years with “the annual walk” being a thing. The annual walk had a varied cast, and varied between two or five people, none of whom were female. For this stage of the walk we had Iona, a she, walking with us: she works at the same school as Neil, and has had her head turned by Neil’s stories of the great outdoors. Little surprise that she developed a yearning the outdoors and wild adventuring such as Neil and I partake of. As a starter for 10, she was included in the cast of Part 5 of our JM walk. Iona has taken to referring to us as Jack and Victor, and enjoys “the banter”. Which probably makes Iona “Isa” in the scheme of things. Personally, I prefer Chewin’ the Fat’s lightkeepers but there you go. The start of this leg is the old ferry crossing to North Queensferry although the John Muir route is along the Forth not across it. The ferry itself was used by pilgrims (and presumably others) to get to St Andrews. At the time of writing (November 2018), a new long distance walk is being established from Culross and/or North Queensferry to St Andrews. Alistair Moffat describes a more easterly route in his book “The Hidden Ways”, but the notion of pilgrimage is the same. Obviously the place is dominated by the bridges and the stone that Neil and Iona are so playfully advertising sits between the Rail Bridge and the Road Bridge (as opposed to Queensferry Crossing — the new bridge). The stone is in the carpark behind the church which was originally built as a Carmelite Friary. And looks somehow Mediterranean. But it is good that the early Pilgrims could get their chips before crossing the Forth. Iona presented an interesting departure from the norm. Neil and I are old buddies; when we talk on a walk, it tends to be a load of stupid inanity, techy stuff about maps and nav. Sometimes about family. Maybe stuff about previous walks. But it isn’t particularly conversation, more odd exchanges. Sometimes discussions about books, TV or films. Walking with Iona, who is noticeably female, broadens and lengthens the communication. Different. She also enjoys the joshing between Neil and me, hence Jack and Victor. So it’s different. Iona is new to the walking thing so that provides a focus. All three of us are pretty much ourselves, have our views. It has been quite obvious that Iona will walk her own way (and probably still several paces ahead of me); Neil is a determined old so and so with very clear views and a particular view of life. I’m pretty stubborn when I want to be. We see different things in the world: I drive Neil mad by photographing the oddest things. I like to understand what I’m seeing. It was a brilliant, blue sunny morning, slight breeze and perfect for photies of yon bridges. Spectacular. The bridges run in order of age, east to west starting with railway and ending with the crossing. A far cry from Queen Margaret’s Ferry. There are memorials to the men killed in constructing the rail bridge. There are believed to have been 73 fatalities during the building of the bridge. Bringing Isa Iona on board with the potential of being a female jinx was clearly not a reality: for a start Neil and I are not ships: wrecks maybe, but certainly not ships. The weather was brilliant throughout, no rain. We had a bit of “which way?” trouble to start with, but were able to pick up the JMW stickies although the big clue was to read the map. Doh. Walk up the hill, walk under the bridge. Walk under the crossing. Doh. The Road Bridge is still as impressive as it crosses the Hopetoun Road: it just looms over the houses below. How can you live with that? And the Crossing is also impressive. The picture shows the reality but what it doesn’t show is me, standing on a pole and a fence trying to balance 6 ft up in order to take a photo. Much laughter, but no accidents. We began the walk in earnest and headed toward Hopetoun House. 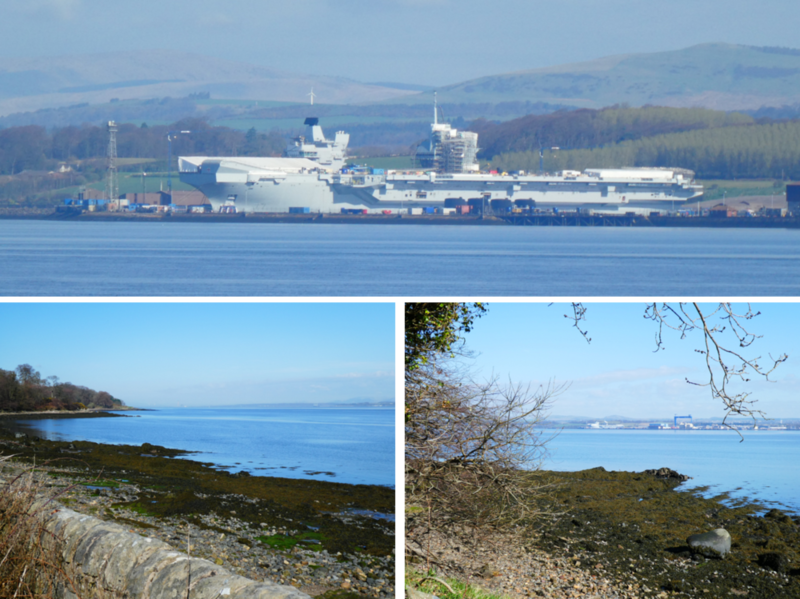 The path along the Forth is wooded, so pretty pleasant with good views across the Forth to Rosyth and the aircraft carrier being built there. We were suitably impressed. Hopetoun is a huge house, home for the Hope family from 1600, and now home to various scenes from “Outlander”. The path moves on from the wall and sweeps round to pass through three or four cottages which belong or belonged to the estate, one of which had washing out. This prompted discussion about washing. Neil and Iona both identified people whose tenancy terms stipulated, for instance whether and when washing could be hung out. We speculated about the terms for washing currently. The Way tends to move around tourist sites and indeed shopping centres: it appears to avoid providing boosts to local economies, although having only met 3 other walkers on the way this may not be a great loss. In contrast to the front gate, the western side of the grounds, is wilder. The estate does seem to value walkers, with dead posh signage (in miles of course…). Appreciated. The mausoleum passed un-noticed, and the path tracked north to the forth. We noticed the smell of wild garlic, and commented on it. Iona hadn’t noticed or picked up what it was, but it been a frequent whiff during the walk along the Forth. Reaching the waterside, we were able to look back to the bridges to the east. Our stomachs told us that it was approaching a good time to eat, and we sought a handy seat. There were a few: the Forth amd the sea allow plenty of driftwood, including tree trunks, to fetch up on the shore. Refuelling having taken place, we resumed the walk through Wester Shore Wood. The wood is bordered to the south by an escarpment that runs from east of Hopetoun up towards Blackness. Still a pleasant walk, and we were heading towards home ground, Blackness being at the eastern extremity of the Falkirk Council realm: beyond that is Bo’ness where the Antonine wall ends. The small beach with washed up stones and shells, bordered by grass is a warm memory for me. Reaching Blackness led us to become a bit frisky. Which accounts for Iona’s crouching to maximise Neil’s height. This largely stems from a certain photograph taken some years ago in a studio in Keswick which did sepia prtraits of folks in period dress striking formal poses. The resulting photograph clearly establishes the long and tall of it all, me being the former and Neil the latter. Neil would be upset if I didn’t remind him periodically of this. And Iona was pleased to help…. Blackness is another location used in the filming of Outlander, the interior of Blackness doubling for Fort William in the series. It is also a rarity in that it sells hot drinks, biscuits and various tourist goodies. Which include Outlander goods. So we were able to sit in the courtyard, eating snacks and sipping coffee. And using the toilet. Blackness was a significant pillar for the defence of the Forth, and a stronghold for the warring nobles of Scotland. It was built in the 1440’s. It served variously as a fortress, as a prison, and as an armoury for the High Seas Fleet that fought at Jutland. At 24 km, the South Queensferry to Linlithgow stretch is one of the longer stretches to walk. The walk is easy going, but it feels long. And the novelty of walking along the Forth has definitely begun to fade. Leaving Blackness the path is well-founded and the land to the south rises to an escarpment. You walk between land and water. The view up and across the Forth is different but not necessarily spectacular, but not without interest. The Antonine Wall running between Clyde and Forth ends in the east at Carriden, looking over the Firth of the Forth to Fife. The feature that looms on the horizon now is the ‘Gannet, Longannet power station. It was coal powered, initially fed on underground conveyor belts from the Longannet mine on the road between Kincardine and Kinross. Neil and I met after my family and I moved to Kincardine. Neil was and still is a time-served welder (non-practising), and was at times employed to do maintenance on the belts and other welding jobs. First hand experience. The Firth of Forth was part of a huge coal field north and south of the Forth, with mines extending below the Forth. Indeed the Longannet mine and the Kinniel Colliery were connected below the Forth (30 April 1964), to try to ensure the longer term viability of Kinniel and Longannet and mining in the area. That struggle ended with Margaret Thatcher and the 1984 miner’s strike. Neil and I don’t talk about politics. It’s complicated. The Gannet is now being decommissioned, and within the next two or three years the towers and massive cube standing close to the Kincardine Bridge (built 1936) will be no more. So the skyline will change forever. Bo’ness itself had a working colliery until the 1980’s. It was formerly a port which had become overshadowed by the invention of Grangemouth at the mouth of the River Carron. 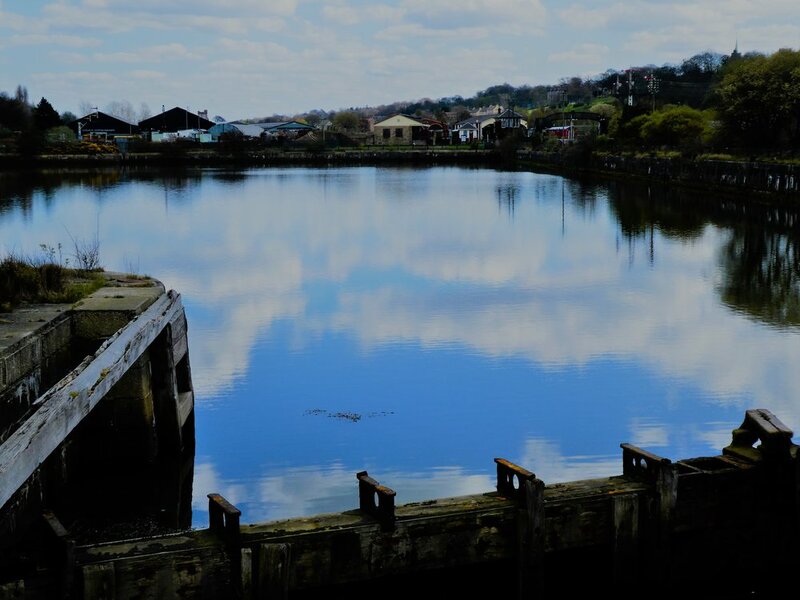 Walking round Bo’ness has echoes of other parts of the walk along the Forth, with landscapes that speak of the loss of industries and the building of other lives. Bo’ness is physically a bit of a siding with the motorway passing the place bvy, but there are signs of a fierce pride. It has for long time been popular for the Bo-ness and Kinneil Railway which still runs its steam trains to the delight of children, large and small. The Way runs beside the railway for a while before heading up the hill to Kinneil House on the Antonine Wall where is a tourist information office and small museum. Bo’ness enjoys its history. It can be a lively place with a small contemporary garrison of Roman Legionaries who appear from time to time to strut their funky stuff. There are good people there, proud of their heritage, dynamic in their approach to heritage. The port has disappeared, but there are still substantial workings that point to the past. Kinniel House also plays host to the cottage where James Watt worked at perfecting a viable steam engine. Not much to look at, but noteworthy nonetheless. The Way marking leads the up to Linlithgow Bridge via the cheerfully named Fishers’ Brae. Apparently it was the custom for fresh fish to be taken from Bo’ness up to Linlithgow via the Fishers’ Brae. Unfortunately, we had none about our persons…..
Neil had a slight perplexity at this point. He was under the impression that the Way passes through Linlithgow Palace, which it doesn’t. However, in fairness to Neil he was looking at an older version of the JMW routemaps which apparently show the Way going through Lithgy Palace. And YouTube video of the JMW website does have a section with Cameron McNeish and the way designers in Linlithgow Palace on the path going through the Palace. And so to the end of this leg: Linlithgow Bridge.